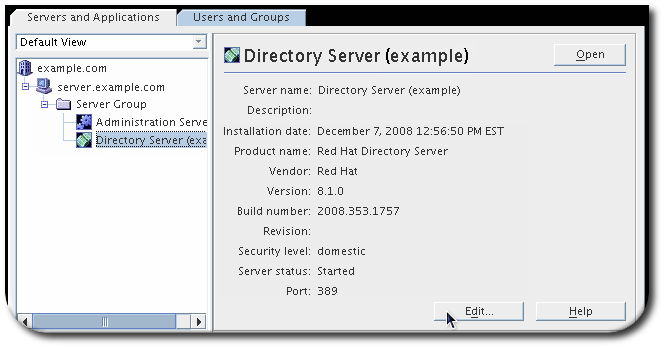 The server instances managed by the Red Hat Management Console are arranged in a hierarchy. At the top is the admin domain. Within the domain are hosts, representing different server machines. Each host has server groups, which identifies an inter-related group of Directory Servers using the same Administration Server instance. 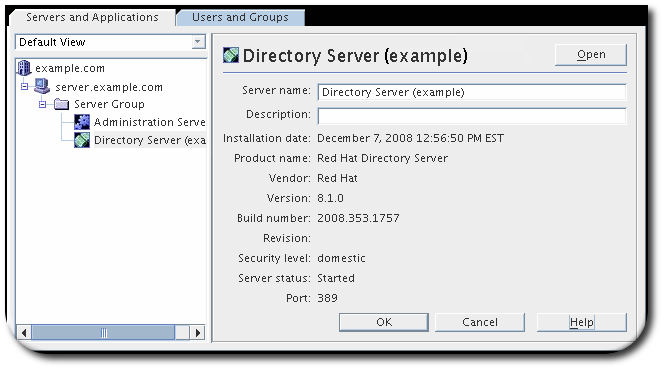 The individual Directory Server instances and a single Administration Server instance belong within a server group. There can only be one Administration Server instance per server group. These high level entries can be created and managed in the Red Hat Management Console. The Red Hat Console displays some information about every admin domain, host, group, and server instances. Most of this information — such as the installation date and build number — are not editable, but some information is. In the Servers and Applications tab, select the entry to modify. Edit the instance's information. Every entry has the option to change its name and description. The host, which is the physical machine on which the instances are installed, also has the option of changing the location. An admin domain is a container entry for server groups (and each server group contains Directory Server instances which are configured to work with the same Configuration Directory Server and the same Administration Server, which is also in the server group). In the top menu, click the Console menu item. 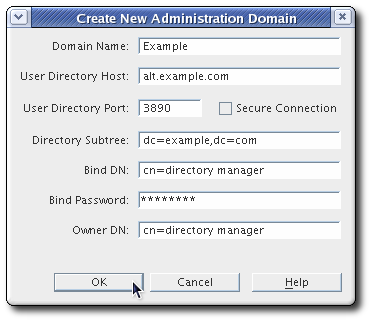 Select Create New Administration Domain. Fill in the admin domain's information, including information for a new Directory Server instance. 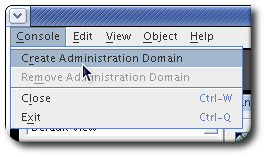 To edit an admin domain, select the entry in the server window and click the Edit button. 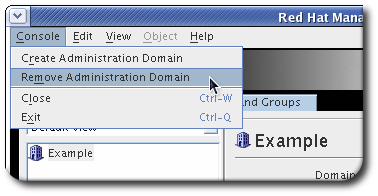 The admin domain settings affect all servers within the domain. Making any changes to the admin domain settings means that all servers in the domain must be restarted. Highlight the admin domain to remove in the navigation tree. Any server group and servers within the domain must be removed before the domain can be deleted.